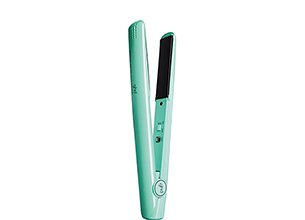 Dressed in the latest shade of jade, the ghd IV styler has a new season makeover! Inspired by the hottest pastel colours on the catwalk, you can add a pop of on-trend colour to your styling routine. The ghd pastel collection features the ghd IV styler in three super-glossy fashion-forward shades; Periwinkle, Jade and Lavender, all with contrasting black plates. With ceramic heat technology to straighten and smooth, and a rounded body to create curls and waves, the ghd pastel collection has all the versatility that you’d expect AND comes in a limited edition collectors edition box. Available: ghd, selected hair salons. I have aways been a ghd fan and bought the very first plain black styler that came to South Africa. I still, to this day, find that no other hair styler works like a ghd does. It styles my hair in a matter of minutes and they are always reliable. I love, love this Jade Styler that was inspired by the catwalk. It looks very pretty on my dressing table. It is sleek and easy to hold and perfect to go traveling with as it is lightweight. Every time I use it, it actually makes me happy as it is so pretty! I love my GHD! (had it for 5 years now) it’s the one and only straightener that works, so although it’s rather pricey it is worth it considering its’ effectiveness and quality (it lasts for years). The only problem I have had with it is that it is quite damaging to hair my hair if used often, I have cut down to using it weekends only as I was just getting too much heat damage and split ends. I’m not sure if the GHD heat protection products would help with this, I haven’t tried them because they are a bit expensive, I just use TRESemme Heat Defense. But overall this in my opinion is by far the best hair straighter I have ever used. And it’s so pretty too! I love this styler! I had my first ghd for 6 years (and still going strong) then decided to get this pastel jade ghd which is gorgeous but most importantly it works wonders! ghd is the only straightener that I have found to work properly, with lasting results on my hair! I have received the purple limited edition GHD gift set in 2008 from my boyfriend. He has given the the best present ever as I have good hair days . GHD is a must have gadget for every teenager/lady who would like to have their looking as if they have walked out of a hair salon. GHD has been my best friend for many years I can honestly say that it’s the best hair tool on the market today and it just keeps getting better. I can’t live without my GHD!! I have just recently added my second GHD to my collection ;) I feel once you have one you always will. By far the best hair investment I have made. Love the new colour and range! I bought my GHD about 5 years ago and granted that I only use it about twice a month because I already have very straight hair – I love that this gives me that sleek finish I want and incredible shine. I’ve used other brands that actually make my hair look dull and dry. It’s definitely a key purchase, something every women should own because if you take care of your GHD, it will last you many years. In fact, some of my friends think that my 5 year old GHD is brand new. I love the new colour ranges and designs that are available now, they’re so cute!